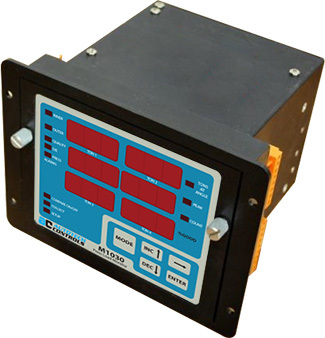 2 Sensors (expandable to 4) in one small panel mount 7.25"x5.5"x5.9"
Alarms for quality, die, press (normally "OFF," "ON"
Collect mode (displays "ON" indicates "Setup Mode"
Programmable Load Monitor, Mini PLM M1030-E from Autotech, is one of the best investments in tools for a press. It offers an economical entry into the Press Load Monitoring. The Low Cost M1030-E measures Load or Tonnage on a press by using strain gauges mounted on load bearing members, such as press columns. The M1030-E compares the measured load against user programmed limits for Press Protection, Die Protection and for Process Trend. If the measured load is outside the programmed limits, Mini PLM de-energizes the appropriate fail-safe relay that can be used to stop the press, warn the operator and/or signal supervisor control. The Mini PLM has two counters for counting total number of hits, as well as the number of good parts made. A part is considered good if it did not cause any alarm or fault during stamping. This limit is programmed by the user in Tons. The unit de-energizes “Positive Press Limit” relay when measured tonnage exceeds the limit. This limit is set around the rated tonnage of the press and intended to protect the press from overload. This limit comparison cannot be disabled. This limit is programmed by the user in Tons. The unit de-energizes “Negative Press Limit” relay when measured tonnage exceeds the limit. This limit is intended to protect the press from reverse or snap-through tonnage. This limit comparison can be disabled. The Die Protection Band is created by programming limits around a “reference” tonnage. The reference tonnage is automatically learned by the Mini PLM during unit setup. This unit measures the maximum tonnage in each press cycle and averages over a programmed number and hits. The average tonnage is considered as reference. The Mini PLM maintains a reference for each installed sensor. User programs positive and negative deviation around this reference to create a die protection band. The process Trend Band functions similar to Die Protect band, EXCEPT that the reference tonnage for process trend band, called Process Trend band, is not fixed at the time of setup. On the M1030-E, each display is considered to be a different mode. The detailed descriptions of the modes, displays, key responses are described in the Display Modes Reference. This list in the overview section refers to modes described in the reference section. The M1030-E has five simple keys for programming as well as operation of the unit. Response to key strokes in different modes is described in the Display Modes Reference.